Northern Ireland striker Will Grigg admits it is “massively disappointing” that the only mark he made on Euro 2016 was through the medium of song. Michael O’Neill’s team bowed out of the competition on Saturday night following a 1-0 round-of-16 loss to Wales when Grigg was a spectator from the bench, as he had been throughout the group stage in France. The 24-year-old was one of only three outfield players in O’Neill’s 23-man squad not to see the field at the tournament, despite coming off a campaign where he scored 28 goals in all competitions for club side Wigan. While he was overlooked in a playing capacity, his name was omnipresent in the stands, on the streets and in press conferences as he gained a popularity across the continent that no one else in the Northern Irish camp enjoyed. For all the hype surrounding ‘Will Grigg’s on Fire’, though, the player himself wanted to make his impact on the pitch at Euro 2016. 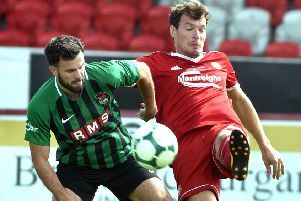 “The song is one thing, but to come to a tournament like this and not play, as a professional footballer, is massively disappointing,” he declared. Even without an appearance from Grigg across the four games, O’Neill has not been able to avoid questions about his striker’s flammability. There was an audible groan from the Northern Ireland boss when he was once again asked to comment on Grigg’s absence after the defeat on Saturday. “He was our fourth-choice striker,” O’Neill said. It is the tactical nous O’Neill has displayed that has won him more admirers out in France. His bold decision to make five changes and switch his system for the game with Ukraine ultimately sent Northern Ireland through and club chairmen will have been impressed by the way his players were well-drilled to stop Robert Lewandowski and Gareth Bale. Despite recently signing a four-year deal with the team after delivering major-tournament football for the first time in 30 years, a £750,000 release clause in O’Neill’s contract would not be a huge deterrent to the bigger clubs in England and Scotland should they identify him as a potential manager. “There’s going to be people who are looking at him,” said his captain Steven Davis. “He has done a hell of job here with us. We’ve had unbelievable progression in the last couple of years. We are unlucky not to be going to the quarter-finals, for me. “I’m sure there are a lot of clubs who are thinking he is a suitable candidate for a role. Obviously we would like to keep him, selfishly.